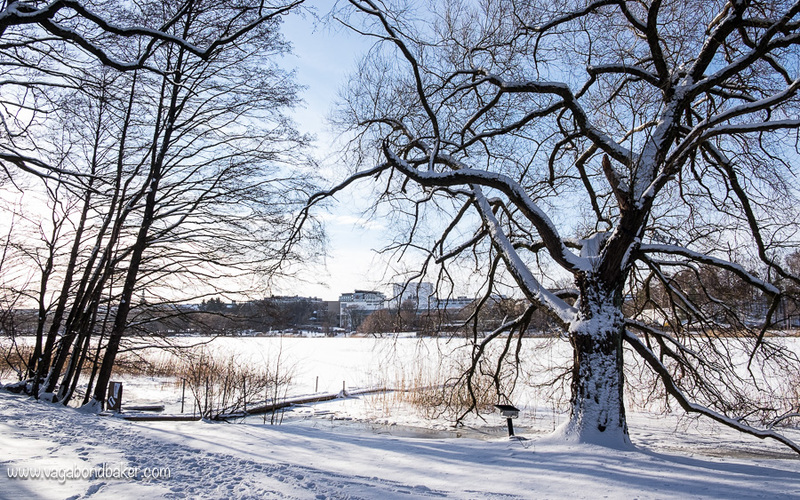 Helsinki’s coastal location is glorious, yet it is also abundant in parks and green spaces: nature and peace is easy to find. 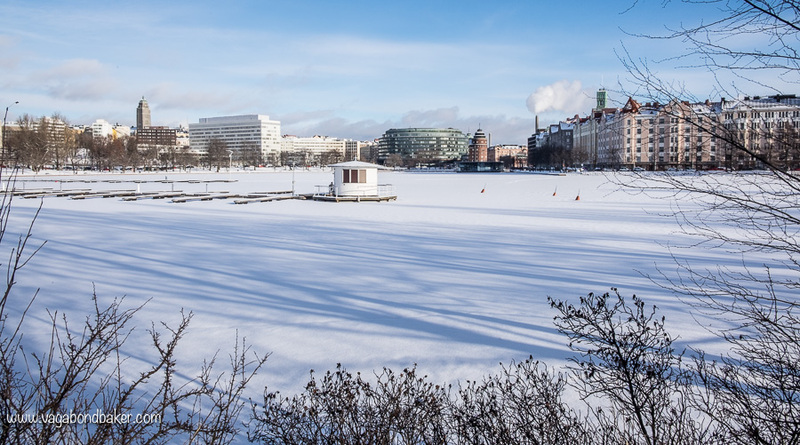 Right at the heart of the city, just a short walk from the central railway station, are two beautiful bodies of water edged with parkland: the connected bays of Kaisaniemenlahti and Eläintarhanlahti, and the reed-fringed, landlocked bay Töölönlahti. Footpaths meander through trees along the waterside; within minutes you leave the city behind and nature envelops you. Only the elegant buildings across the bays remind you that you are still in Helsinki. I had the pleasure of doing this walk back in early February: the bays were frozen over and snow glittered crisply in the sunshine. 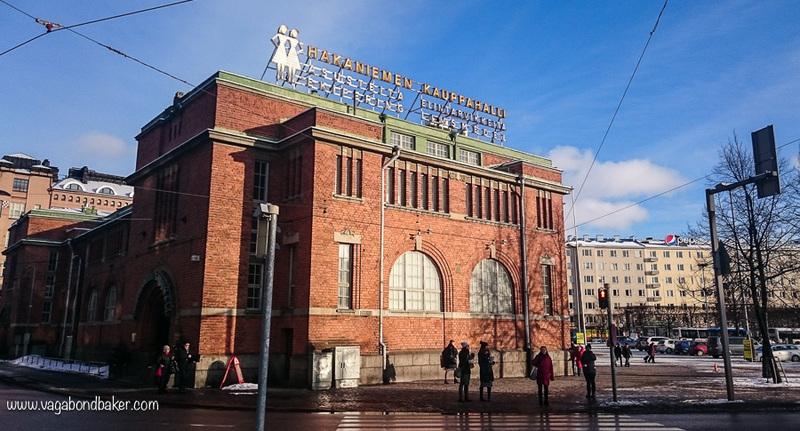 Beginning at the handsome Central Railway Station, I walked up from Railway Station Square (Rautatientori) into Kaisaniemi Park (Kaisaniemen Puisto). My boots crunched through the snow, following a trodden path towards Kaisaniemenlahti, a bright white ‘lake’ beyond the park. 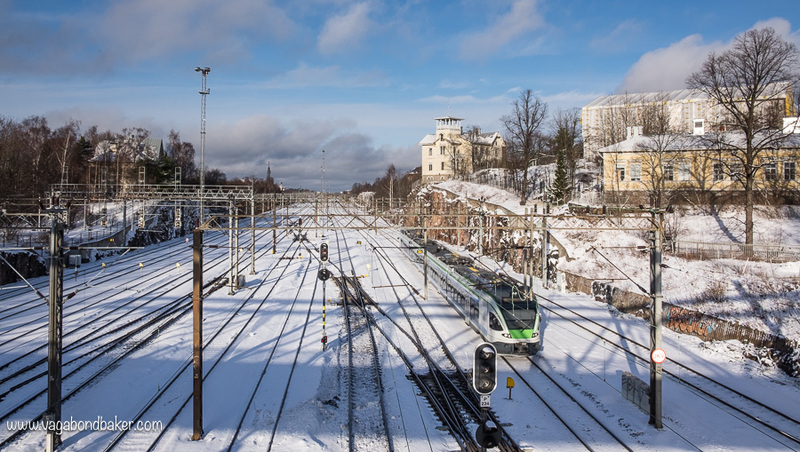 All the railway lines arriving and departing Helsinki Central Station run north along the left-hand side of the park, skimming the edge of Eläintarhanlahti and dissecting it from Töölönlahti: what a beautiful way to arrive into Helsinki! 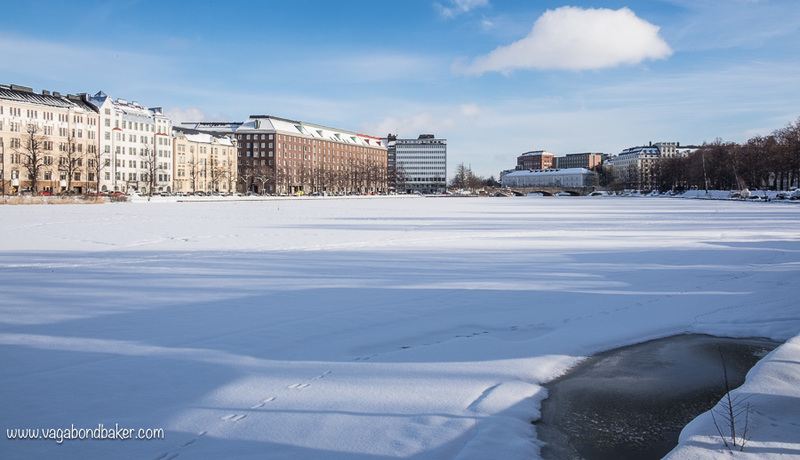 I followed the path between the railway and Eläintarhanlahti, stopping to photograph the view across the ice over to Hakaniemi. 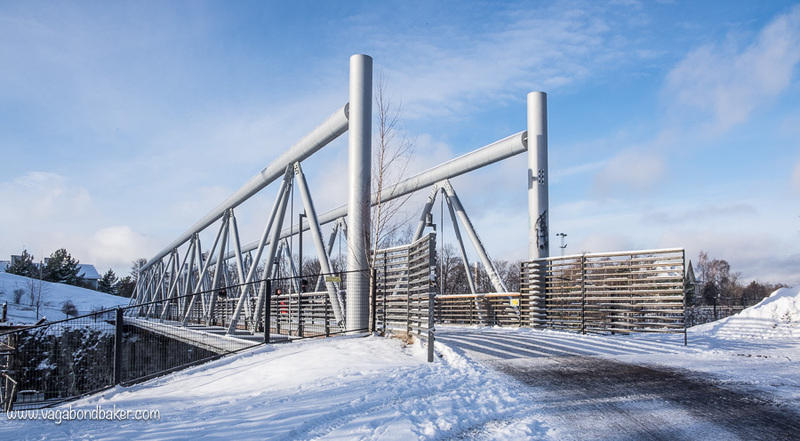 The path opens out at the north edge of Eläintarhanlahti into another lovely park – Tokoinranta, where there is a wide footbridge over the railway. And what a great viewpoint this bridge is: pretty wooden houses peek through the trees and trains glide below along the many tracks. Over on the other side of the railway the path winds down through trees, past those grand wooden houses, passing the Cafe Sininen huvila – closed up for the winter. Töölönlahti is overlooked at the top by the glass greenhouses of the Winter Garden (Talvipuutarha), its symmetric gardens leading down to the bay. 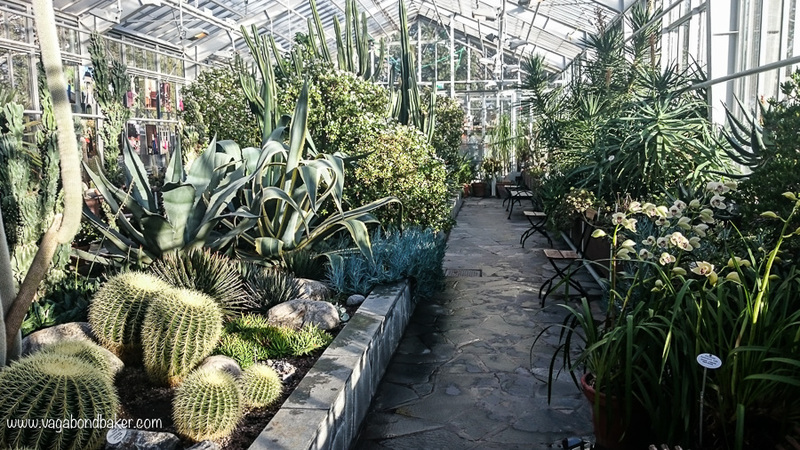 I walked up to the greenhouses, to step into the steamy world of ferns and tropical plants. 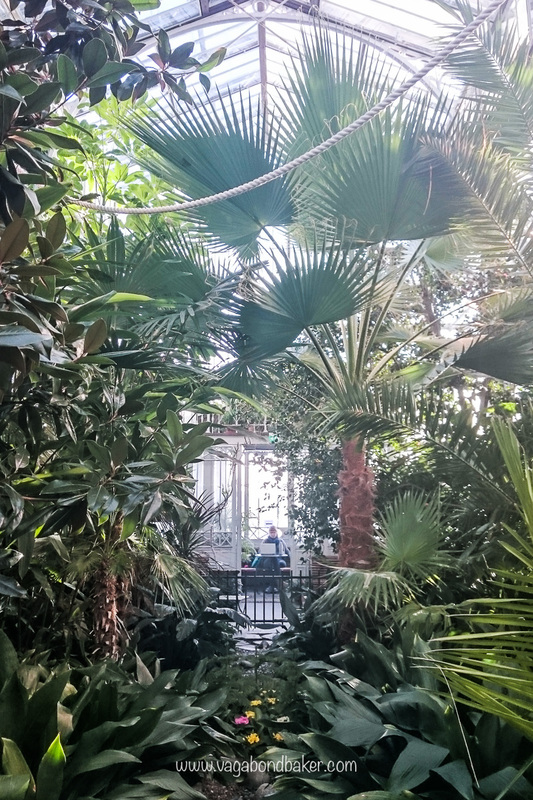 The Winter Garden is free to enter, just watch out for your camera steaming up from shock of a freezing day into the hot atmosphere! Through the glass panes you can see Helsinki in the distance, and there are lots of seats and benches for you to thoroughly thaw out amongst the foliage. 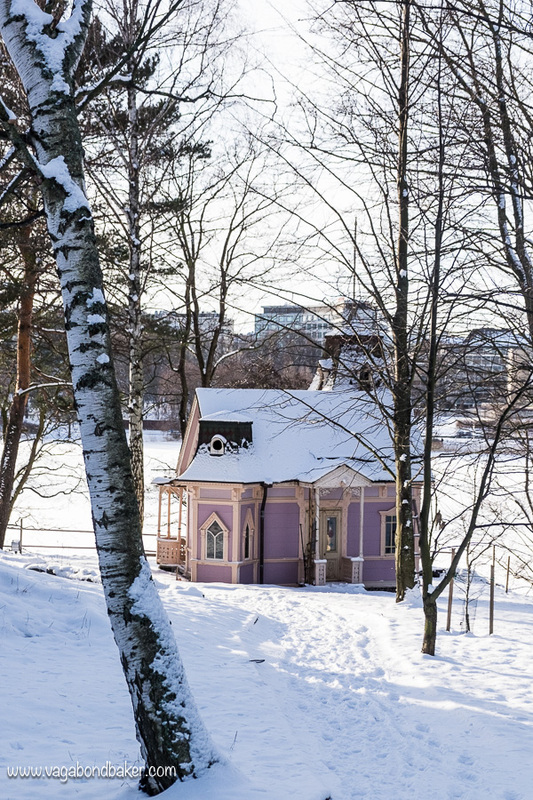 I circled Töölönlahti, walking clockwise along the wide path alongside locals walking their dogs, jogging, or strolling in the sunshine. It certainly felt like this was the place to be on a sunny day whatever the time of year. Some people had clearly left the main path and ventured out onto the frozen bay, their footsteps betraying their movements through the snow. 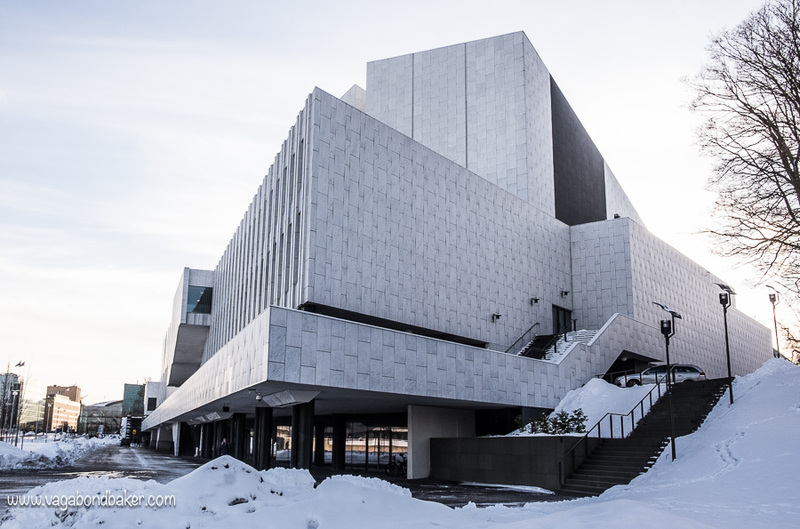 The walk to the south end of Töölönlahti passes the National Opera House and brings you under the striking lines of Finlandia Hall (Finlandia Talo), designed by Finnish architect Alvar Aalto – you get great views of these buildings from all around the bay. 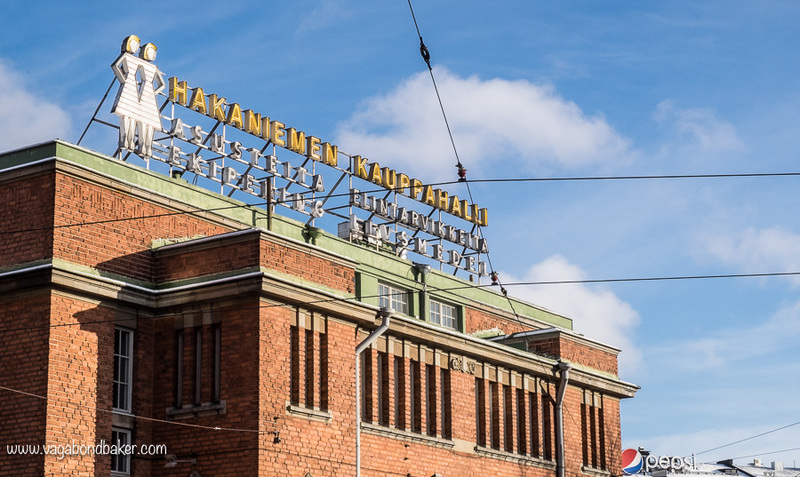 I looped back to the bridge crossing the railway and walked along the top of Eläintarhanlahti to Hakaniemi market hall (Hakaniemen Kauppahalli), where I thawed out again and had a coffee and a huge korvapuusti in the cosy surrounds of this wonderful market hall. 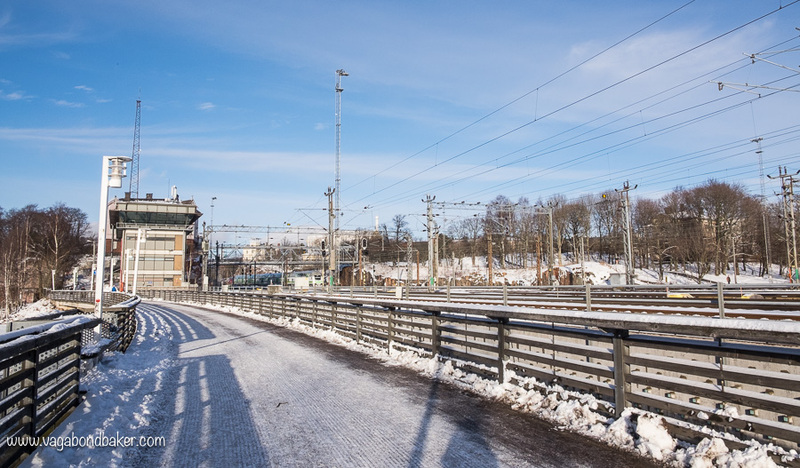 I crossed the market square and walked down to Pitkäsilta Bridge, crossing it, then turned off the main road along the southern edge of Kaisaniemenlahti back to Kaisaniemi Park, and the railway station. It had been a beautiful walk, the perfect way to spend a couple of sun-filled hours in Helsinki. The walk was 7 km in all. There are many lovely walks in the city, out to beaches and parks, but I wholly recommend doing this walk if you have the time. 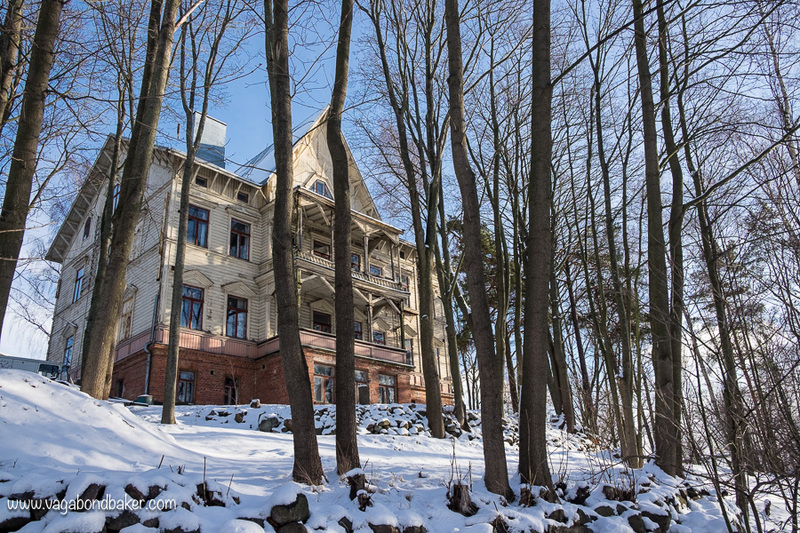 Even if you only walk around Töölönlahti, you shall be rewarded with stunning views, peace, and plenty of fresh air. This walk would be perfect at any time of year. 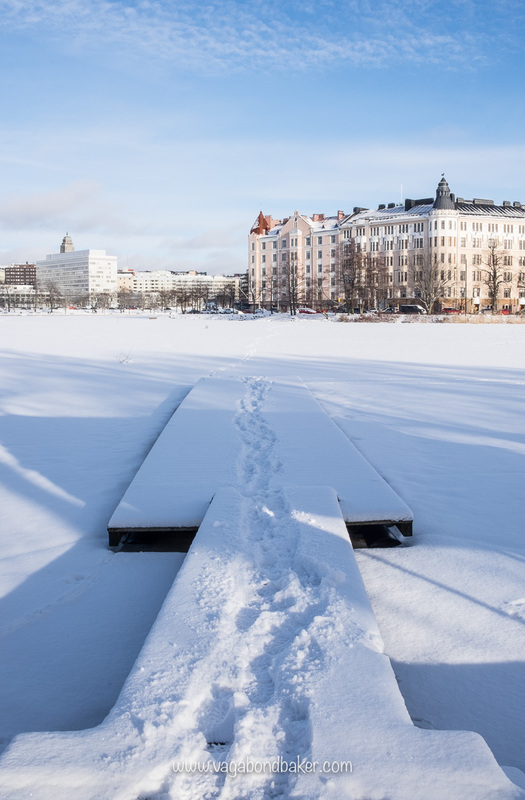 50 Ways Finland Made Me Smile This Winter Five weeks and fifty things! Have you wandered around these bays, or visited the Winter Gardens? Tämä on minun lempireittini kävelyilleni kotikaupungissani Helsingissä. You made it so special! I feel blessed to be able to live in this small city. 🙂 It is very special! Tämä oli mun suosikkini kävely Helsingissä! 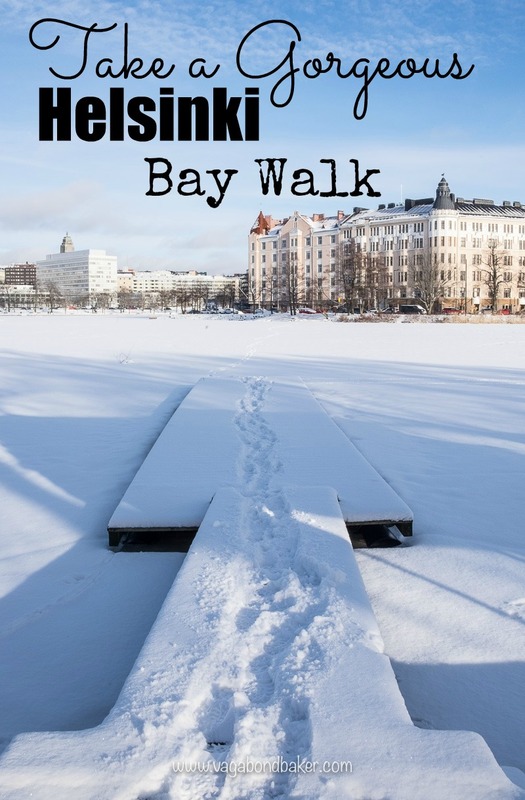 Thanks for sharing 🙂 we land in Helsinki around July next year, probably be busy with tourists but I bet it will be nice with summer foliage, I would like to do some walks to get to know the city, I might just add this one to the list. Kirjoitat Suomesta ja Helsingistä niin kauniisti! Pidän blogistasi muutenkin, mutta suomalaisena olen erityisen otettu innostuksestasi Suomea ja suomen kieltä kohtaan. Tämän kommentin lukeminen suomeksi ei varmaan tuota sinulle ongelmia. Viime hetken vinkki pian alkavaa kevätmatkaanne varten: jos vain ehditte niin käykää Skagenissa, Tanskan pohjoiskärjessä, sillä se on upea paikka! Siellä on sympaattisia keltaisia taloja ja ihan pohjoisin kärki on hienoa hiekkarantaa, jonka kruunaa majakka! Hyvää matkaa ja tervetuloa Suomeen! Voin lukea suomeksi parempi kirjoittaminen ja puhuminen suomeksi! (<< as you can see from this! Haha!) Tänä viikonloppuna me pysyamme vain kaksi päivää Tanskassa, toivon käydä Aarhuseen. Majakkan Skagenissa olisi täydellinen nähdä, koska pidän majakoista! Kiitos vinkistä!